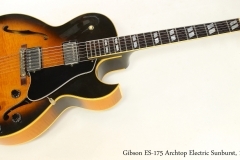 The Gibson ES-175 archtop electric was in production from 1949 until 2017, because it does exactly what many jazz and rock guitarists needed it to do. Comfortable and reliable, the ES-175 delivers a rich tone and its laminate construction makes it feedback resistant, compared to carved solid top models. To that point, it did appear on large, higher volume rock stages, notably in the hands of Steve Howe of Yes. It was also a common choice for early rock and rockabilly artists. The Gibson ES-175 Archtop body is built with Maple laminates, with Mahogany for the neck and Rosewood for the fingerboard. At this point, the model received split-parallelogram position markers. The sunburst finish was standard. The last ES-175 was built during 2017, and is presently not even available from Gibson as a custom order. This example dates to February 5th, 1991 and was built at the Gibson plant in Bozeman Montana, then run by Ren Ferguson. It is complete and carries its original hardware. 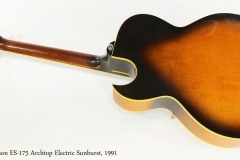 The nitrocellulose lacquer finish is quite yellowed and has some significant checking, and there is a small chip near the tailpiece, but is otherwise in good shape. Fret and fingerboard wear is insignificant, close to zero, and it plays very well. The original brown Gibson hardshell case is included. It is in good condition though its lock is broken – the latch has come away from the case lid. This could be repaired.